We’ve taken a lot of house tours together on my blog over the past 12 months, so I thought it would be interesting to see which ones were the most popular, getting the most comments, clicks, and shares. 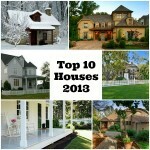 I think it tells a lot about my readers that more cottages than mansions made the list. Click the pics and links below to see the posts if you missed them. 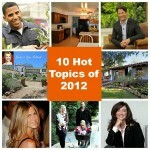 HGTV Dream Home 2013: Want to Win It? That old schoolhouse conversion is amazing! I also can’t get enough of the cottages – especially the readers’ own houses. It’s fascinating to see how other people live, even if is “staged” for some pretty pics. I’m so glad to see the Laurel, MS house came in first place. MS has been my home since 1990, and Craftsman cottages are my favorite house style. There aren’t a lot of that style of house here, so I especially enjoyed seeing this house and the wonderful things the new owners have done with it. The Cornish beach hut made it onto my to-do list when I first saw it. It’s still on the list! Someday we’re going! Love so many of these, but Fig Tree Cottage is my very favorite! It’s funny about the cottage vs. mansion stat- I think it was Home Depot that asked “home trends” questions from their customers to predict the new year, and one of the biggest of those was that people were looking much more for quality vs. quantity. Smaller spaces do give the opportunity to use more expensive, better materials. Gratefully, I don’t think it is just HoH readers- I think so many poorly-built mcmansions have left a bad taste in our collective mouths. They are all lovely, but on this overcast kind of chilly day here, I would like the coziness of the home at Blackberry Farm (even though I know it is huge.) 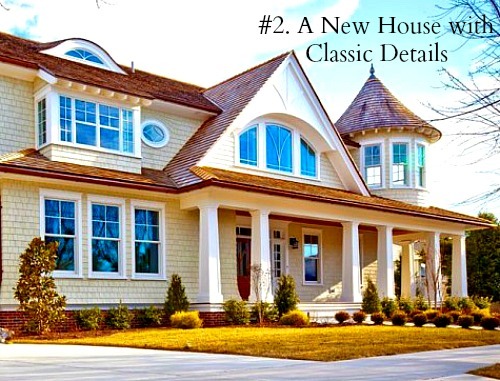 I really like how they mixed the classic details with the rusticness of the house – plus the location would be wonderful. Thank you Julia for all the work that goes into everything that you share here with your readers, and thank you BIG time, for helping my first year in the world of blogging be such a fun one! Erin’s house is my Favorite House of All Time. Your list of these popular-post homes truly reflects what I have long felt is the reason most of us here long for older homes … the interesting millwork and architectural details, and higher ceilings. In a modern home, you can hardwood your floors and paint your cabinets, and use old English colors of paint, but some warmth and beauty is missing when there is no generous molding, tall baseboard, double-hung windows, etc. etc. I’m thankful for my home, but still love to look at these architecturally interesting ones! My faves are definitely Brooke Giannetti’s and the Croatan Cottage. They are both definitely my style – not like every other house, modern details added thoughtfully, and best of all – NO recessed lighting!! I love the beadboard walls and woodwork in Croatan, and the Giannetti’s house, even though I’m not really into all white, is beautifully done with gorgeous decor and a gorgeous kitchen. I’ll take either one! Brooks house in California is my favorite . I like it because it is livable ,very tastefully decorated without being contrived ,and those windows never stop . Second contender is the home in the Smokies .Wish there were more pictures of the inside . I like that they kept the integrity of the age of the home by using the reclaimed wood . I love the Ocean City Victorian and Erin’s 1925 Craftsman home. I could see myself living in any one of those places. Love them all! each is nice for their own unique qualities. Can’t wait to see what’s up for 2013– Happy New Year! I love all of these, but I really LOVE Erin’s craftsman in MS! So inspiring!! I want to live in Fig Tree Cottage and vacation at the Cornish coast cottage. Is that asking too much? Erin’s house remains my all-time ideal. Thank you so much for featuring it and for introducing us to Erin and Ben. I so admire their can-do spirit and optimism. And I love that Erin has appreciated that house since she was a kid. It’s like a fairy tale come true. 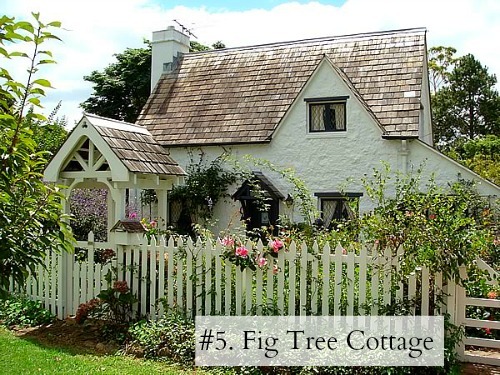 What a pleasant surprise to see Fig Tree Cottage on your list – all the way over here on Tamborine Mountain in Queensland, Australia. I couldn’t agree more! These all are just beautiful, Julia! (I hope the one in Ocean City is still there!) I hope that Lily recovered ( that no one else fell ill) and that you all were able to really enjoy the second part of the holidays! I could make myself right at home in any one of these houses. What a dream if I could spend a night in each one depending on my mood! I’m finding it harder and harder to get good quality content online and I always make an effort to comment on an article I believe is useful. Well, this is me leaving a comment.